One of the most favorite things Benji, our capuchin, loves to do is open up locks. My wife has been telling me for a while now that I should create a board with locks on as an enrichment device. It is after all another great way to keep your monkey busy when you’re not around. I was then also rather excited when I noticed that somebody posted a picture of the above latches board. 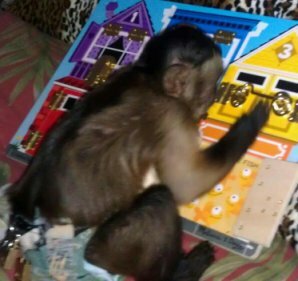 This board contains different kind of latches that open up little doors to keep your primate entertained. While doing research for my article on primate enrichment, I found out that some monkey owners hang horse hay bags up in the enclosure of their monkeys so today I went to our local farm store (Farmking) to pick one up. I was pleasantly suprised to find out that they only cost about $11. They’re made with poly pvc coated nylon which makes these bags very sturdy and easy to wash.